A RUP LIFE: Power Rangers Dino Charge Breakout On DVD 7/12 + FREE Printables! 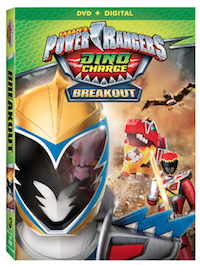 Power Rangers Dino Charge Breakout On DVD 7/12 + FREE Printables! I have a confession to make. I've never seen Power Rangers until just recently. It took until son number three to have one of the most popular television and toys hit our house. (I guess there is some truth that the more boys I have I'm bound to own EVERY boy toy!) Of course Power Rangers appeal to both boys and girls but I only know boys in this house. So my five year old was literally jumping for joy when we received Saban's Power Rangers Dino Charge: Breakout for review! Saban’s Powers Rangers are back in action with Power Rangers Dino Charge: Breakout, arriving on DVD (plus Digital), Digital HD, and On Demand July 12 from Lionsgate. The Red, Black, Blue, Green, and Pink Rangers must once again rely on each other and their new dino-charged powers as they battle to defend the Earth from the villainous Sledge. This all-new Power Rangers series ranked #1 in its time period across all TV with kids 2-11. So my little guy ripped this video out of my hands and watched it pretty much immediately. He has a DVD player in his room so he chilled out enjoying himself. For days we have heard all about the Gold Ranger who is featured in this DVD. If you have a Power Ranger fan in your house - they too will love this one! You can purchase Power Rangers Dino Charge Breakout at your local retailer or online at stores like Amazon.